Published in 2009 by the University Press of Florida, and recipient of “Best Coast Guard Heritage Book Award” of 2010 from the Foundation for Coast Guard History, this book describes the technical design history of all the rescue craft ever used by the U.S. Life Saving Service (USLSS) and the U.S. Coast Guard (USCG) from the 1800s to current day. 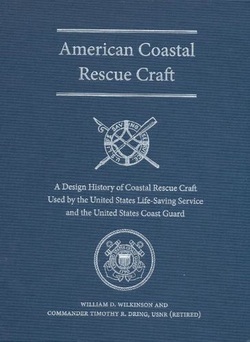 It is the first of its kind ever to be published in the United States on this topic, and provides detailed information, drawings, and photographs (many of which have never before appeared in print) for each type of surfboat, lifeboat, and utility craft, along with a complete list of every boat ever built and the coastal rescue station(s) to which it was assigned. It is organized into two major sections: 1) a general historical narrative; and 2) detailed technical appendices (provided on a CD packaged in the back of the book). The book is co-authored by William D. Wilkinson, Director Emeritus of the Mariners Museum in Newport News, VA, and CDR Timothy R. Dring, USNR (Retired). Mr. Wilkinson, now deceased, was engaged since the 1950s in the historical research of small craft used for rescue purposes, and was a well-recognized expert in this field. CDR Dring has had previous experience in the Navy working closely with the Coast Guard on harbor and coastal defense, and has a great interest in and respect for the humanitarian rescue operations this Service conducts with specialized small craft. The extensive research by Mr. Wilkinson and CDR Dring that went into this book, including reference to original USLSS and USCG documents held by the National Archives, has had the full support of the USCG’s Historian’s Office. This work addresses a long-standing deficiency in the documentation of Life Saving Service and Coast Guard history as it relates to the boats that were and are currently used for coastal rescue purposes. It can be ordered directly from the publisher, University Press of Florida, by either calling their book order department (800-226-3822), or by accessing their website (www.upf.com).